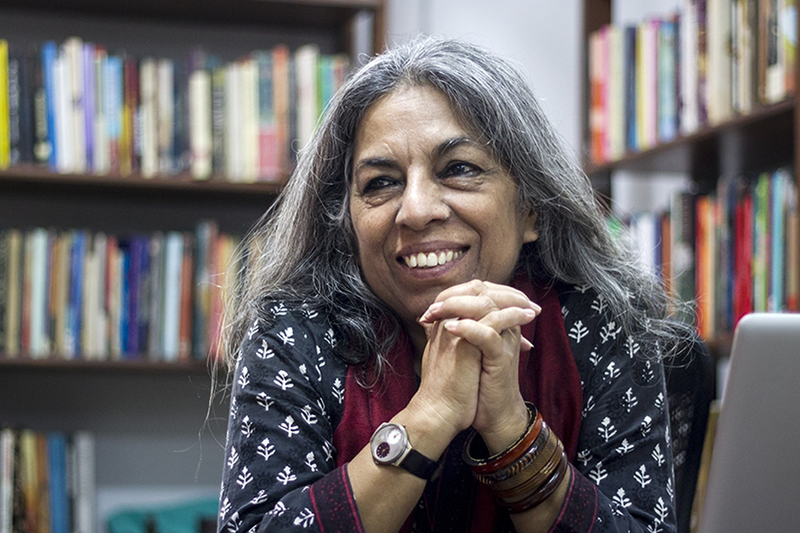 For over forty years, Urvashi Butalia has worked to give marginalized social groups, particular women, in India a voice. As a feminist activist, she has worked for positive changes in laws relating to women in India and has been closely involved in reforms of laws dealing with dowry, marriage, sexual violence and sexual harassment at the workplace. She is a well-known and highly regarded essayist who writes for both national and international newspapers and magazines in India and abroad. Her particular subject is the situation of women in India on which she has also spoken at many conferences. Born in 1952 in the northern Indian state of Punjab, Urvashi Butalia studied literature in New Delhi and, for a short time, South Asian Studies in London. She taught at Delhi University for over twenty years and is currently a visiting professor at the newly founded Ashoka University. In 1984, together with Ritu Menon, she founded the first feminist publishing house in India, Kali for Women which, over the years, published books that have become contemporary classics in women and gender studies both in India and elsewhere. In 2003 she set up Zubaan (tongue, voice, language), an imprint of Kali which is today the leading publisher of women’s writing in India. Zubaan publishes works by women from many of India’s 22 languages, translating them into English and Hindi. Zubaan is unique in the Indian publishing landscape for being Independent, political, and completely committed to the cause of women. In its Young Zubaan series Zubaan has pioneered the publishing of books for young people on subjects that still remain difficult to address in India, such as alternative families, death, fundamentalism, disability and more. Although not directly involved in politics, Urvashi Butalia is well-known throughout the country for her advocacy for the rights of minorities and for urging India and Pakistan to deal with the trauma of their violent pasts and espouse the road to peace. Her book of oral histories of the Partition of India in 1947 The Other Side of Silence: Voices from the Partition of India is considered the most important work in South Asian history in the past two decades. Based on interviews with witnesses and survivors of the violence of that time, it documents how they lived through the political division of India during which a million lost their lives. This book, which remained on India’s bestseller list for six months, has been translated into many Indian and international languages. Since 1997 Urvashi Butalia has written a regular column on Indian realities in Lettre Internationale. Urvashi Butalia has participated in numerous international conferences as an organizer and speaker. Recently, she initiated Cross Border Conversations, a conference of European and Indian women writers, with eight European nations taking part. She was responsible for the co-design of a conference series promoting reading in India, which is carried out with the support of the Goethe-Institut, New Delhi. During the #Aufschrei panel discussion for International Women’s Day in 2013, she discussed everyday sexism and sexual violence against women with the British feminist and blogger Laurie Penny, among others, at the Friedrich Ebert Foundation in Berlin. Urvashi Butalia is the recipient of several national and international awards, including one of India’s highest civilian honours, the Padma Shri, in 2011. In 2002 she was made Chevalier des Artes et des Lettres by the French Republic.